After playing for Grattan United, at left full, for twelve years, Eddie was roped in to refereeing by Mick Aherne. According to Eddie, Grattan in those days were one of those teams that always came close to winning something but never did. Whilst watching games and referees in Church Road after finishing playing Eddie decided that that was for him and sat the beginners course in 1971 with Pat Kelly, Barry Kearney, Gerry McGrath and Kevin O’Sullivan. Of the five each and every one made the League of Ireland panel. Eddie was promoted to the League of Ireland panel in 1975 and stayed on it until 1983. The highlights of his time on the panel were, without a doubt, the FAI Senior Cup Final in 1980 and a European Cup game in the same year. The FAI Cup Final saw Waterford overcome St. Patrick’s Athletic on a 1-0 scoreline in a game that Eddie says was full of tension. Kevin O’Sullivan refereed the game and Tony O’Sullivan ran the other line. 1980 was the year when Eddie joined Gerry McGrath and Tony O’Sullivan on a European Cup game across the pond in Newport, Wales. History was made on that day, as it was the first time that a team of Cork officials took charge of a European game. In 1976, Eddie took charge of the AOH Cup Final in Turner’s Cross between St. Mary’s and Avondale United. He was ably assisted on the day by Pat Kelly and Paddy Welch. During his time as a referee, Eddie has also refereed the Munster Minor Cup and the Munster Junior Cup. In total, Eddie McGeough refereed over 500 games in 12 years. 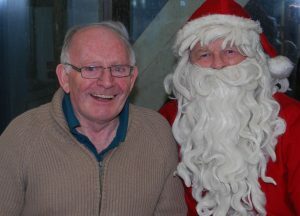 Since joining the ISRS (Cork Branch) in 1971, Eddie McGeough has always been a staunch member of the Branch, has been extremely committed and dedicated and has supported everything through the years.Anyone who is refereeing for a considerable amount of time will always make life long friends and Eddie McGeough is no exception. Eddie said that he’s made a lot of friends in refereeing and his best friends are all referees. I spoke to a number of referees to get an insight into Eddie on and off the pitch. Frank Casey told me that Eddie is as a great companion and wonderful friend and has contributed immensely to refereeing in Cork over the years. Eddie Mullins described Eddie as being a very decent, honourable and straight fellow and a very good friend. He said that if you asked Eddie McGeough to do something for you he could be sure he’d do it. He went on to say that as a referee Eddie always did the job efficiently and had a knowledge in refereeing that was first class. Regarding assessing, Eddie Mullins said that Eddie really knows his stuff and would always cut to the chase. He’d always get his message across, would always say what he thought and could always pinpoint a referee’s weaknesses. In 1983, Eddie moved into assessing straight after finishing on the League of Ireland panel. He was anxious to stay involved in refereeing in some capacity and when Billy O’Neill told him that he was looking for somebody to assess in the Limerick area Eddie jumped at the opportunity. Twenty years after first taking up the role of assessor and Eddie is now the Chairman of the Assessors in the Cork area and assesses in the National League on a regular basis. Football has always been a part of Eddie’s life since he was five years old watching Cork United playing down the ‘Dyke with his father and his immense love of football is what has kept him in assessing for such a long time. Since he started in 1971, Eddie feels that there have been both different standards and styles of refereeing over the years. Eamonn Farrell and John Carpenter were the two he admired the most when he was refereeing and he believes that Alan Kelly is one of the best referees he’s seen across both spectrums of refereeing. One aspect of refereeing that has changed a lot according to Eddie is the use of the advantage. When he was refereeing if there wasn’t an advantage after a couple of seconds you couldn’t bring it back and it was just tough luck whereas today referees are awarding free kicks after four or five seconds if the advantage doesn’t materialise. Of the current crop of referees Eddie believes that there is a great attitude from a group at the top but there’s always room for improvement and people need to be very committed.Over the past number of years Eddie has noticed that there is a different attitude to Europe, if you haven’t made it by 30 for Europe they don’t want to know you. Even with the National League you really have to make it a younger age with the average age of referees in the National League decreasing all the time. Indeed as Eddie says, we’ve only got one auld fella in Cork at the moment in Eddie Foley; the other four are only young fellas. When we got on the League of Ireland panel most of us were 35 or 36 with Pat Kelly being the only exception at 21. They’ve even brought down the retirement age to 45 from my day, which was 47. It’s becoming more and more a young person’s game. The grading system is always a source of much debate among referees as to it’s merits but Eddie believes that it’s a good system. The fixtures secretaries can look at their list of referees and know what games that a referee is capable of doing. They’ll also realise from the list that a Grade One has got to have that something extra to have achieved their Grade One status and feel comfortable giving them certain games. Eddie emphasises the fact very strongly that a Grade One referee has to put in a lot of work to get that far but must continue putting the work in on a regular basis if he is to keep his grading. If he isn’t committed and professional in what he is doing the assessors will consider downgrading him to Grade Two and replace him with somebody who is more deserving of a Grade One ranking. Whether it’s sitting in the Donie Forde stand in Turner’s Cross or at a game in Killeady or Kanturk, Eddie said he always looks for the same fundamental aspects in a referee’s performance. Interpretation of the Laws of the Game, the referee’s attitude to the game, his appearance and his reaction to different issues are all the basic qualities looked at. Before I finished I had to ask the question: refereeing or assessing? Eddie took a long puff on the cigar, looked up for a second and then with a smile replied, “assessing”. Almost 40 years since the beginners course in 1971, Eddie is still assessing and he will continue to do so because football is his life from refereeing to assessing to maintaining the immaculate surface on the pitch in Turner’s Cross.